Unless the crisis of masculinity in El Salvador is directly tackled, no effort on behalf of women’s organizations will be able to reduce the levels of violence against women that take place in the country. On 1 June, Salvador Sánchez Cerén became the new president of El Salvador. He is the second president in the history of the country to belong to the FMLN. This party was created from the guerrilla army that fought in the Civil War, which lasted from 1980-1992. Interestingly, one of his campaign platforms focused on the inclusion of women and women’s rights within the scope of his public policy vision. The FMLN has championed in its mandate the participation of women in public affairs, but as of yet, this resolve has yet to be actualized. The question remains: how is the new President planning to tackle violence given the current mechanisms that exist to advance women’s rights? Ciudad Mujer is an example of a progressive project created under the presidency of Mauricio Funes. Located in five cities around the country, the centres claim to offer sexual and reproductive health resources, holistic attention regarding cases of violence against women, economic empowerment, and the promotion of women’s rights. That said, pervasive misogyny reigns in El Salvador. Judges have brazenly admitted that they are disinclined to acquiesce to the clauses outlined in the Ley Especial (a law promoting women’s rights). Silvia Juárez, prominent member of the Violence Observatory at ORMUSA, asks how, when judges ‘govern with their stomachs’, the country will ever reach a state of rights and democracy. The observatory for which she works claims an impunity rate of 98% when it comes to cases of violence against women. Furthermore, policewomen have denounced their male colleagues as both perpetuating norms of gender violence, as well as acting in direct contradiction to the Special Law. A policewoman interviewed in a BBC article notes that her male colleagues are liable to dismiss gender violence cases by saying that the woman should try to sort the situation out with her partner. The big challenge, notes journalist Ignacio de los Reyes, is that the authorities themselves begin to eradicate the machismo that still exists within state decrees. How useful are any of the skills promoted by Ciudad Mujer, then, when El Salvador is undergoing a crisis of masculinity, of the most perverse nature? That is to say, a situation in which the levels of violence in El Salvador are so high, that violence against women rises, in part, as a consequence of the quotidian violence that men face in the street every day. Mo Hume writes in her book that in the current climate of extreme violence (augmented by gang violence), violence against women is less of a priority for the state, and has increasingly become a punchbag for men to vent their frustrations. Gang violence in San Salvador Demotix / Jan Sochor. All rights reservedMy research investigates the strategies employed by women’s groups in El Salvador in contexts of extreme violence, both in the public and private spheres (that is, in and outside of the home). I have documented a variety of different avenues via which women’s organizations such as ORMUSA, MSM, and IMU organize in ways that seek to create collective identity and build social capital in order to combat violence against women. The Ley Especial e Integral para una Vida Libre de Violencia para las Mujeres, put into action in early 2012, guarantees women protection from a variety of different gendered crimes, including physical and sexual, but also emotional and economic violence. Projects developed around this Law, however, have little chance of success (in terms of reducing violence against women) unless the attitudes of the country’s men also change. Indeed, in recent months, the feminicide rate in El Salvador has increased again, after decreasing in the months following the initiation of the (original) infamous gang truce. No matter how strong or determined the actions of women’s movements, the phenomenon of violence against women is inextricably tied to the violence that takes place among men. It is not hard to surmise that the new increase in violence against men that will inevitably occur while the fate of the gang truce is in jeopardy will have an effect on the rate of violence against women in the country. While the Salvadoran government seems (at least nominally) to be committed to reducing levels of violence against women, I argue that it will take more than the creation of a Ministry of Women, or directing funding towards Ciudad Mujer, in order to lead to a real change in the lived reality of Salvadoran women. 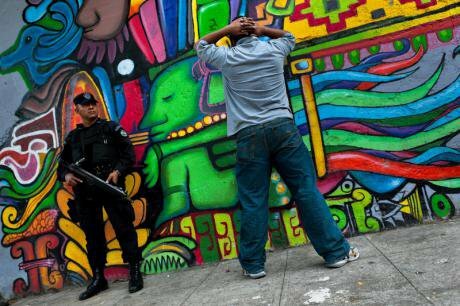 Indeed, unless the government includes a gendered perspective in its analysis – and set of proposed solutions – to deal with a newfound increase in gang (and accordingly, general public) violence, women will continue to represent the hidden faces of violence in El Salvador. Héctor Núñez González is one of the leaders of a program run through Centro Bartolomé de las Casas. The program seeks to deconstruct hegemonic ideas of masculinity in contexts of high violence. In a personal interview, Núñez recognized that the phenomenon of violence “quickly becomes normalized.” As such, despite its good intentions to create new models of what it means to be a man in Salvadoran society, the program does not have a high attendance rate. What is more, the people who elect to attend a course about generating new concepts of masculinity are perhaps not those who need the change of perspective the most. If the new Salvadoran government truly believes that it can change the situation of violence against women by engaging in traditional gender mainstreaming techniques it will be disappointed, as the levels of feminicide continue to rise. If the government instead desires to create a real change in the situation of Salvadoran women writ large, it will need to engage with, expand, and promote programs and solutions that also tackle men’s ideas of both masculinity/ies – that is, in their multiple forms, and femininities, and the ways in which they are deeply relational. Unless Sánchez Cerén engages with the problem of pandemic levels of violence against women – as a direct consequence of violence between and against men in the country -- the phenomenon will not decrease, and, in fact, may rise. Indeed, the women’s movement will need male allies in order to change entrenched gender power structures. With that said, before inviting men to join the cause, society will need to make sure that these men are educated about what it truly means to fight for gender equality. This is where there emerges space for government to play an important role. I am not saying is that there is no value in the creation of a Ministry of Woman, nor the continued support of the Ciudad Mujer project. There are obviously numerous benefits in providing specialized services for women, among which are included projects aimed towards female empowerment through economic security. What needs to be stressed, however, is the fact that unless the crisis of masculinity in El Salvador is directly addressed and tackled, no effort on behalf of women’s organizations will be able to reduce the levels of violence against women that take place in the country. The term ‘gender’ is often fallaciously used as a synonym for ‘women.’ The case of El Salvador clearly indicates that treating the case of extreme levels of violence (and particularly, its manifestation as violence against women) as a purely ‘men’s’ or ‘women’s’ issue, will be insufficient in leading to any change in the lived realities of the people of El Salvador.